How to operate a commercial popcorn machine. Looking for some tips and secrets on how to use a commercial popcorn machine and to how keep it running great for years to come, and without constant maintenance and repairs? Then read below for some advice on how to operate a commercial popcorn machine. Whether you are using your commercial popcorn machine for fun or for profit, you will find tips here that you will not find anywhere else. Commercial Popcorn Machines normally feature three operating controls or buttons. Normally you will find three switches at or near the top front of the popcorn machine . The front meaning the side with the two plexus-glass doors that pull open . The first button normally is the heat switch, or sometimes referred to as the kettle heat switch. This button is your most important button. Once you activate this button, it allows the kettle to heat up quickly up to 350 to 400 degrees F.
The most important thing to remember with this switch is to turn the heat switch to the off position when your popcorn popping is nearing completion. In other words, when you decide you have popped enough popcorn for the moment, and as you hear the kernels winding down in popping intensity, turn off the heat kettle switch. This action prevents your popcorn from burning and keeps the internal parts of the kettle called the heating elements and thermostats from burning out. And don't worry whether you will have enough heat to complete your popping; at this point the kettle is very hot and has sufficient heat to complete the process. The second button is normally the motor button. This button activates the motor that turns the agitator to keep your popcorn, oil, and salt in constant motion in the kettle so your popcorn does not burn. Activate the motor button after activating your heat switch. The third button controls the heat lamp. It is the heat lamp bulb in the upper right or upper left rear corner in your popcorn machine. You can activate the heat lamp after you activate the kettle heat and motor switch. The lamp will help keep your popcorn warm and fresh after you have popped your popcorn. How long do you wait before you add your popcorn, oil, and salt to the kettle? General rule is about 30 seconds before you add your oil, but not more that one minute. Once you have activated the heat switch, you NEVER want to have an empty popcorn kettle on for more than 15 to 20 seconds. As we discussed earlier, you will quickly burn out the internal parts in your popcorn kettle if you activate the heat switch without popcorn and oil. What ingredient do I put in first? You always want to put in the oil first. Especially if you are using coconut oil, wait about 10 seconds after putting the oil in, this will give the coconut oil a few seconds to melt first. If you are using portion pack popcorn paks, like you can find in our popcorn supplies store, first cut off the top part of the package with the oil side. Always having a scissors close by is very important for this assignment. Once you have cut the top open on the coconut oil side, slowing squeeze the oil up (like you would be squeezing toothpaste) and then allow the oil to enter into the kettle. Then cut the top off the rest of the package that includes the popcorn and salt, and carefully proceed to pour the rest of the packet into the kettle. One special note: in order to prevent the burning and scalding of your hands, always try to place a part of the plastic package on the kettle and not your hand. What do I do when the popcorn has finished popping? Don't turn off the motor yet, only the heat button if you are not planning to make another batch of popcorn. You dump the popcorn out using the popcorn kettle handle. Read your operating instruction manual for this operation. Each manufacturer has designed the kettle handle and kettle uniquely. The important thing to remember is to dump out the popcorn gently from the kettle. DO NOT Bang the kettle or swing the kettle hard trying to get out that last kernel. Use your popcorn scoop while your kettle is in the open and in the down position to clean out the last of the popcorn kernels or seeds. There are wires inside the kettle and in the neck of the kettle, and they can break with excessive force or swinging. Then it is off to the repair shop if they break. If you follow these guidelines when operating your commercial popcorn machine, your popcorn machine will serve you well with fewer break downs, and fewer trips to the repair shop. One final note on how much popcorn and oil you need to add to your popcorn kettle..... The quantity of popcorn you can put in the kettle is measured by the size of the kettles. For 4 oz kettles, you can put 4 oz. of raw popcorn seed. For small families or groups, a four once (110 grams) should work out fine. For six ounce kettles, you can put in 6 Oz. of popcorn seed and so on. If you are entertaining or serving commercially a larger group, then a six ounce(180 gram) or eight ounce(220 gram) kettle is necessary. Most commercial popcorn machine kettles allow you to put in up to two extra ounces of popcorn. What is the amount of oil necessary to create great tasting theater popcorn. If you add the popcorn to the kettle manually, the general rule is two thirds popcorn and one third oil. How to make your popcorn with a buttery taste? You will need two things....The buttery topping, and the buttery warmer dispenser. Once your buttery topping is warm in the dispenser. you simply pump the buttery topping over your popcorn. You can even be just like the movie theaters, fill your popcorn bowl or cup half full and dispense some buttery topping over the popcorn, and then fill your cup the rest of the way, and spray a little more on the top. There you have it, the complete movie theater experience. We hope you have enjoyed this article On How To Use A Commercial Popcorn Machine by Standard Concession Supply. And we sincerely hope you will benefit from some of the tips in this article. You may reprint this article for your use. If you reprint this article for a website, you may reprint this article only if you leave the resource box below as is. 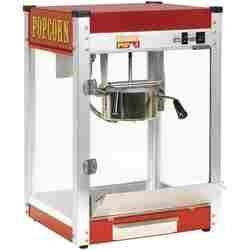 The above information is general information on operating a commercial popcorn machine. Always consult your owners manual for the most accurate information for your particular model. Popcorn Machines for Fun and Profit StandardConcessionSupply.com features a great variety of popcorn machines for home theaters, party-fun, and for commercial use. Standard Concession Supply also features a full line of Nostalgia Electrics Fun Food Party Appliances including mini popcorn poppers, hot dog, cotton candy, snow cone, and nacho carts. If you need popcorn, popcorn oil or salt, seasonings, popcorn boxes or cups, head over to our popcorn supplies page. For a large variety of plastic bowls and accesories, go visit our popcorn bowls store.